How much cheaper is it to fly from Cairns to Brisbane today than in the mid-Thirties? It appears North Queensland Airways operated between 1936 to 1938, based on a Cairns Post report from 1938 on the company’s sale to Australian National Airways. 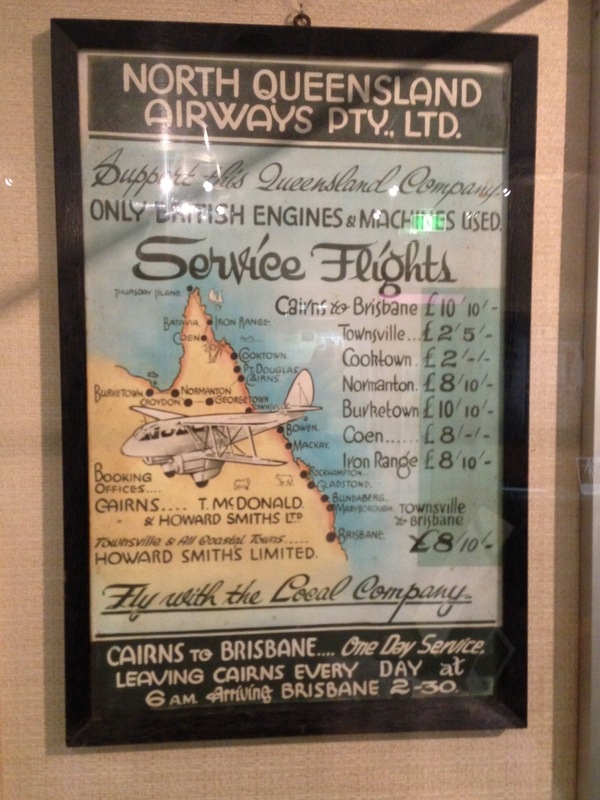 Assuming the poster is from 1937, I’ve worked out that the price of a Cairns to Brisbane flight (10 pounds, 10 shillings in the old money) would equate to around $850 in today’s dollars. This would be expensive, but a Cairns-Brisbane flight would have been even less affordable than this figure suggests, because real wages were lower back then, and this flight would have cost nearly two-and-a-half times the average weekly wage. In today’s dollars, two-and-a-half times the average weekly wage is around $3,000. Compare these figure with the cost of a Cairns-Brisbane flight today of around $150-170. Plus it only takes 2.25 hours to fly today, compared with 8.5 hours back in the Thirties based on that poster. Taking into account both the price reduction and the reduction in flying time, this represents more than an order-of-magnitude (i.e. 10x) improvement in the productivity of aviation since the 1930s. For those interested in data sources, my calculations are based on statistics taken from Wray Vamplew’s 1987 Australians: Historical Statistics, vol. 11. This entry was posted in Cairns and tagged aviation, brisbane, cairns, farnorth, fnq, northqueensland, nq, queensland. Bookmark the permalink. 2 Responses to How much cheaper is it to fly from Cairns to Brisbane today than in the mid-Thirties? That obscure museum can be a hidden gem for stuff like that although some of the volunteer staff can be a bit quirky! Worth a visit though for any historically minded people! I wonder what the comparable rail rate to Brisbane was at the time? Yes, it has a fascinating collection, and I hope they refurb it soon because the interior of the building is in awful condition. The building has so much potential. I imagine that big balcony would be a great spot for a G&T on a Friday afternoon. The rail fare would have been many times cheaper, I’m sure. I’ll check out some of the Courier-Mails at the time and see if I can find a QR ad. Heat map of Brisbane metro property prices – big opportunities in the Western corridor? Where do Queensland's super rich live?